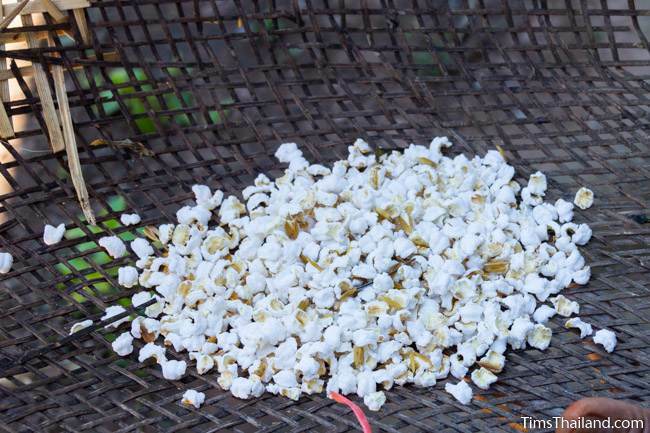 These photos are from the Boon Khao Sak (บุญข้าวสาก) celebration in Ban Khok Sawang, Waeng Yai district, Khon Kaen province on September 24, 2018. 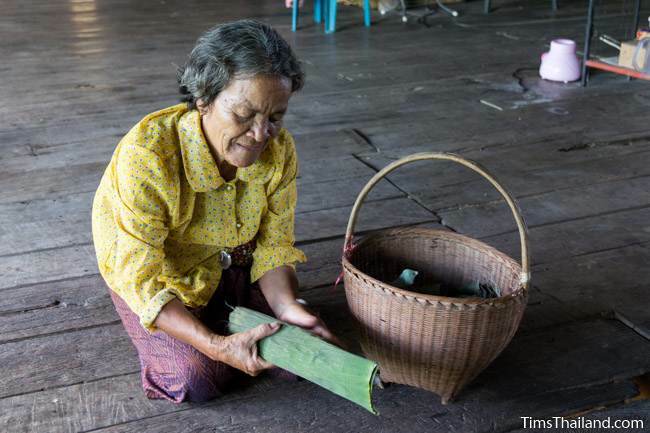 Special thanks to Yai Lune and Mae Saithip for taking such good care of us in the village. 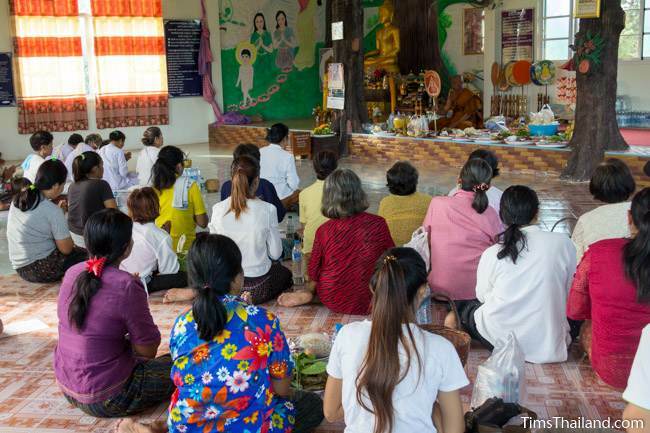 For more information, there's an explanation of Boon Khao Sak and an overview of heet sip-song, the twelve Isan merit-making traditions. 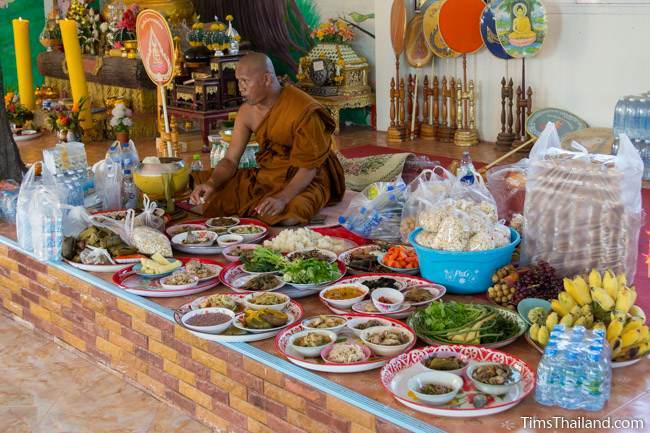 Early morning activities at the temple are no different than those done every two weeks for monk days, except that there's more food for the monk (at this time only one monk was residing there) than usual. 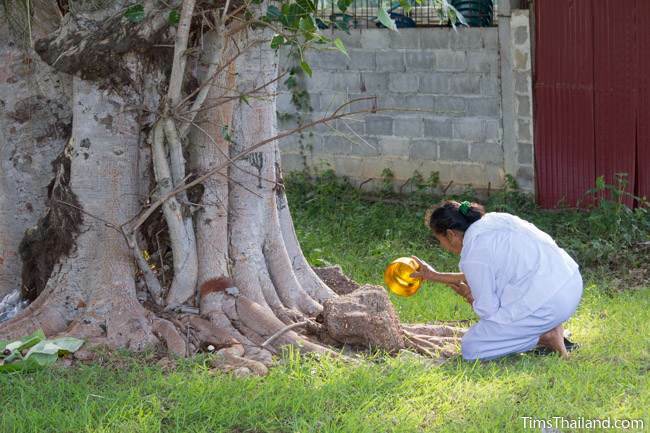 Before eating, the monk leads a regular Thai Buddhist suat-mon chanting and prayer session and then the people do their regular gruat nam ceremony, passing merit onto their ancestors by pouring holy water onto the ground next to a tree. 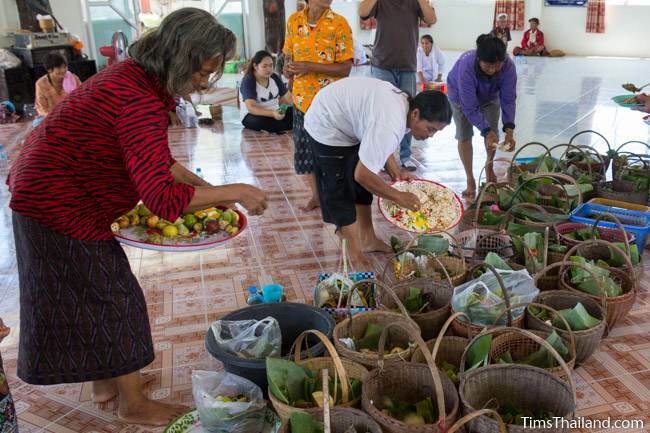 A few people also put banana leaf-wrapped food packages for their ancestors by the temple's bodhi tree, but again, this is part of their regular monk day activities, not something special for Boon Khao Sak. 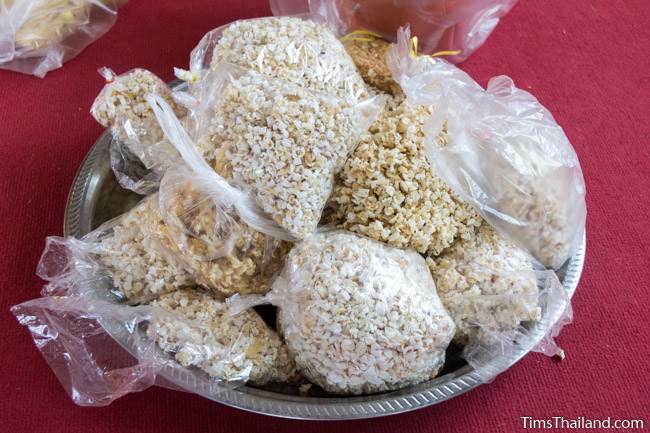 When the morning's monk day activities are done, people head home to prepare more food, all of it wrapped in banana leaves except the namesake khao sak (krayasat in Thai language) sweetened puffed rice snack, which is put in plastic bags for convenience. 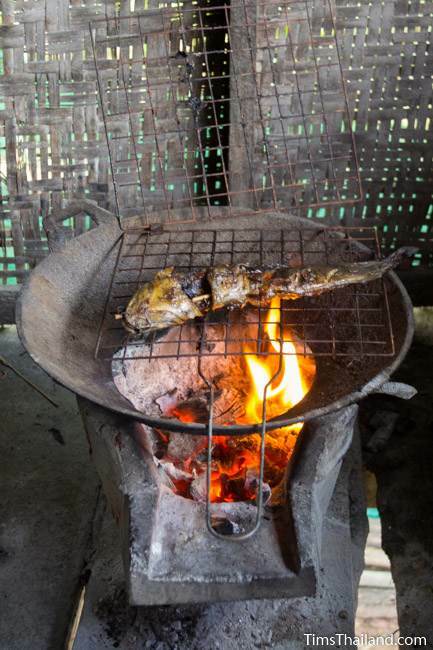 A lot of time goes into preparing the food so much of the work is done the day before. 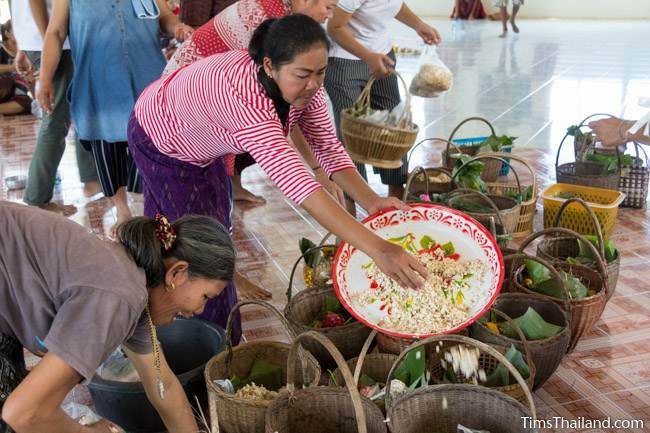 Back at the temple in the late morning, the food baskets are blessed via sacred thread and then the ancestors are called to come take their family's food packages back to the spirit world, ending their two-week residence on earth that began during Boon Khao Pradap Din. 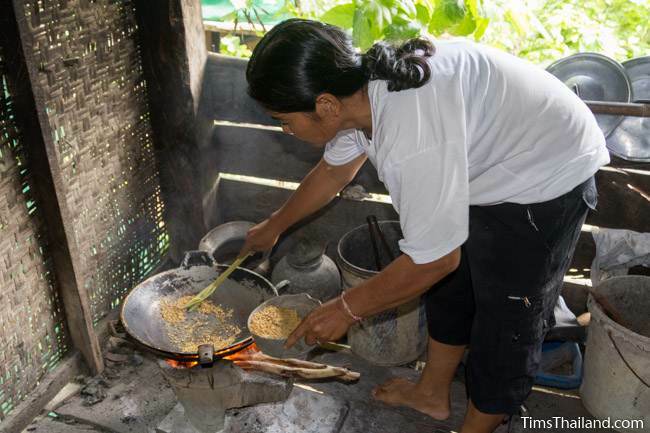 In Ban Khok Sawang the food for the ancestors is not laid out around the temple grounds as is the norm throughout most of Isan; it remains in the meeting hall. 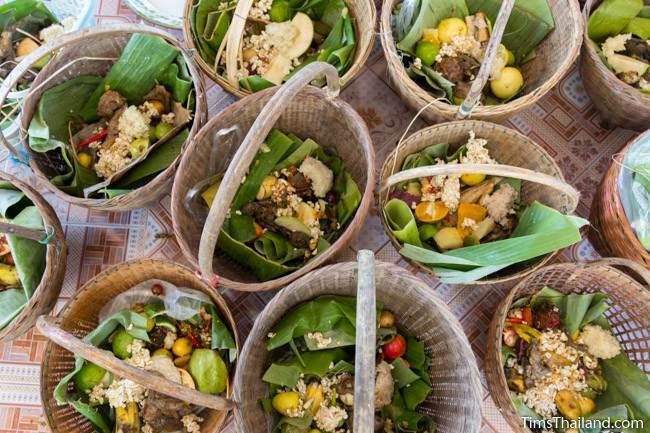 This is because after the ancestors have provisioned themselves from the baskets, the same food will be divided up and offered to the rice field spirits. 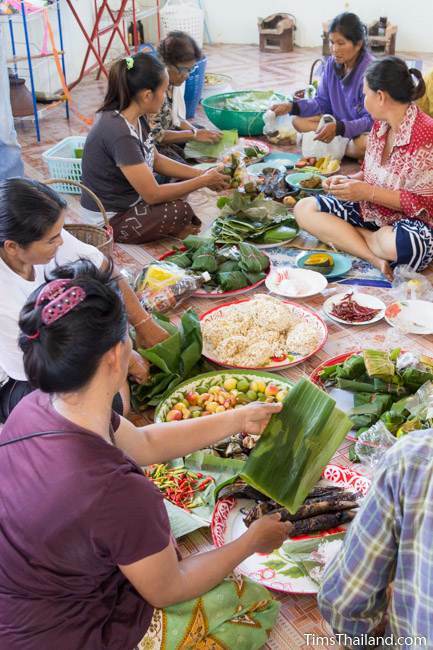 People open the banana-leaf packages and gather each particular food item together on trays and it gets a second blessing. 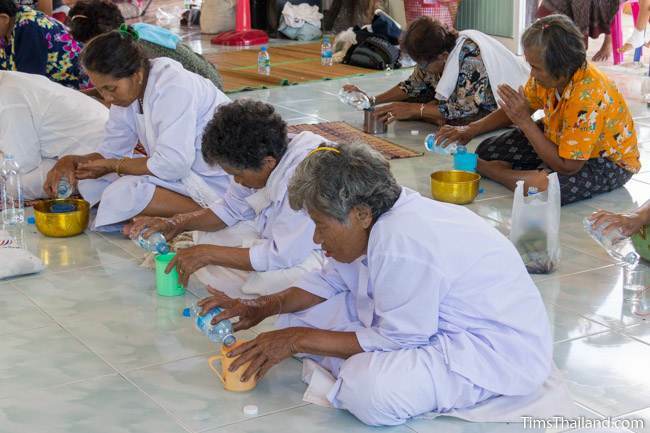 Then more holy water is poured for a second round of gruat nam, this one specifically for Boon Khao Sak. 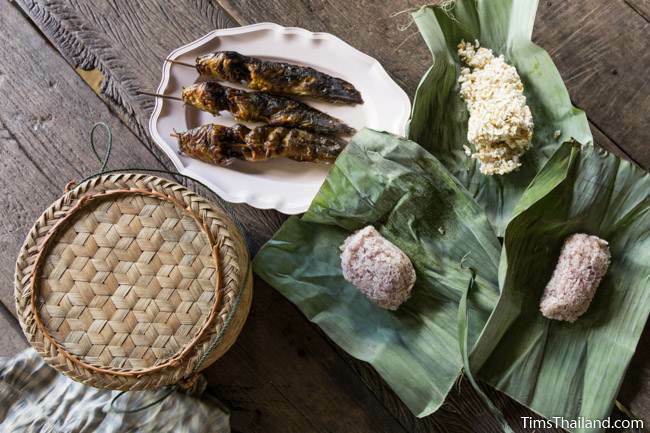 With the ceremonies done, it's time for the monk to eat his mid-day meal. 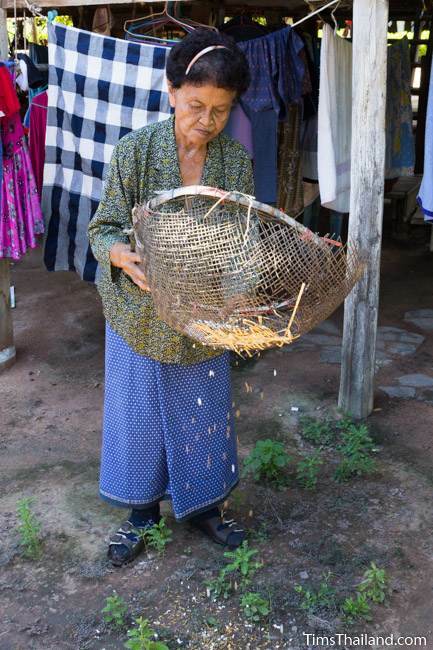 The people of Ban Khok Sawang do not follow the tradition of drawing lots to see which monk gets which family's offerings. 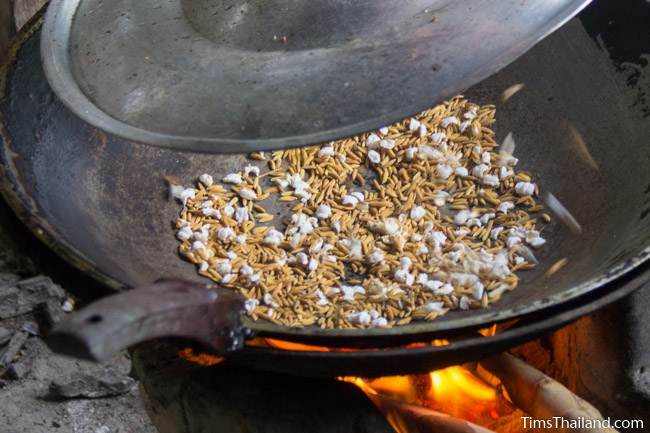 This is not because having only one monk makes the practice pointless, it's not done anywhere else in the region either; and hasn't been within the memory of anyone we talked to. 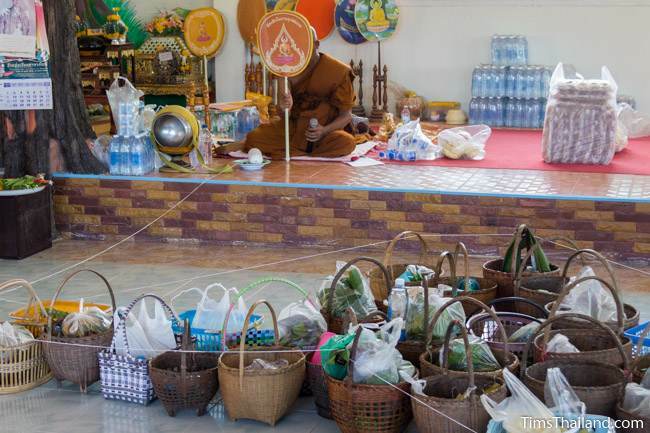 While the monk eats, the people repack their baskets. 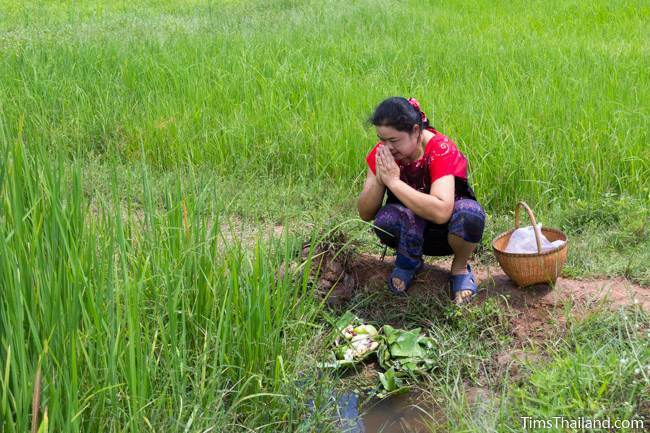 Everyone's food is mixed together so while each family gives thanks at their own field, the offering comes from all. 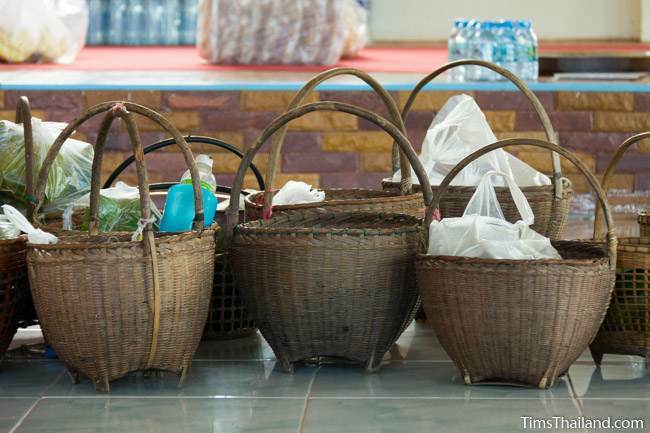 Each basket contained sticky rice, chili dip, grilled fish, Thai eggplant, squash, sweet potato, fresh and dried chilies, fermented fish sauce, salt, krayasat, over a dozen varieties of fruits, cigarettes, and betel. 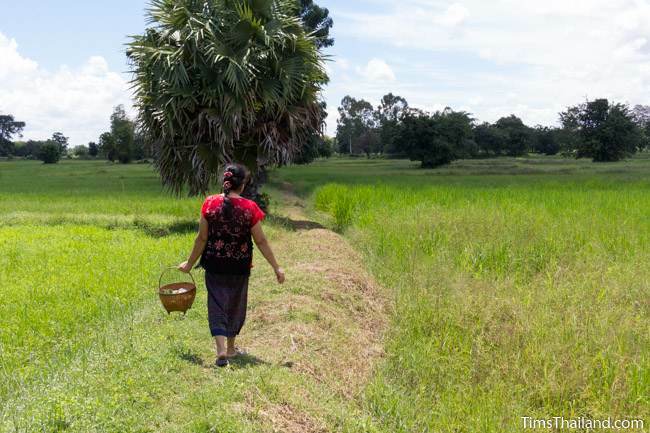 Finally each family takes their basket out to one of their rice paddies to give the food to the rice field spirits.